The concept of using PowerPoint presentations is to get your point across easily and to utilize the full potential of visual and animated learning techniques. PowerPoint in itself is a Powerful tool to compress vast data into small slides for easy presentations and comprehension. Besides having variety of features to make things more memorable, presentable and pleasing for the audience, PowerPoint also supports Video embed, because for the most part, Videos are the best means to get your point across and kindle interest. Since, Youtube is the largest Video hosting Website covering almost every topic, it is natural to look for methods to embed Youtube Video in PowerPoint. In this post we have collected two easy ways you can dispense to embed YouTube video in PowerPoint for live streaming or to play it Offline. You might also want to check Xbox 360 Kinect Fail Videos and Weird USB Gadgets. This method involves direct Video streaming of Video into your PowerPoint Presentation and any Video in this method will not infringe with any Copyright privileges. However, it is recommended to trust this method only if you are sure about your Internet connection stability and speed, after all you wouldn’t want your Video to choke in the middle of something important. Navigate to View on your PowerPoint Tool Bar and then Click on Tool Bars>> and finally select Control ToolBox. You will then have to click on “More Controls” in this Control Tool box which is represented by a hammer plus wrench icon. From the set of controls that will now appear, select “Shockwave Flash Object”. Now, all you have to do is draw and resize a specified area on your slide where you like your Video to be played. Go to Office button -> PowerPoint Options -> Popular -> click “Show Developer tab in the Ribbon”. You will then be prompted with a set of controls, just select “Shockwave Flash Object” . Now draw and resize a specified area on your slide where you would like your Video to be played. 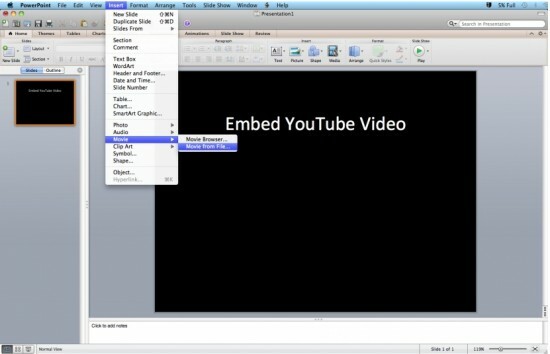 Step 2: Now, using your WebBrowser navigate to the Video on Youtbue you want to add to your Slide. Step 4: You will now need to change the paragraph watch?v= to v/ for proper functioning of your Video. The final URL in this example will look like http://www.youtube.com/v/hChq5drjQl4. Step 5: The area you previously drew for your Video will be presumably marked by a cross, when you see one, right click to reach Properties and go to Properties tab. Step 6: Now, copy the edited Video URL (http://www.youtube.com/v/hChq5drjQl4. )and paste it in the field as a value of attribute Movie; set the value of attribute Playing and Loop to False. Close the Properties tab when everything is done and you are good to go. If you want to embed Youtube Videos in PowerPoint and be able to run the video even when the internet connection is not available, you can follow the steps described in the next section. It should be kept in mind that although there are services that allow Youtube Video downloads, these methods are not officially allowed by YouTube because of copyright privileges. Albeit, you can use this method for your own Videos on YouTube or you can download any Video at your own risk by this method. Step 1: You can either use Firefox Addon or Real Player latest version to download YouTube Videos. However, for the convenience of this post we will assume you downloaded Real Player. Step 2: Install the software by following instructions but keep in mind to opt out of the weather toolbar during installation. When the installation is complete, you will be prompted to close your Browser, which is necessary to allow one touch download feature. So, you have to obey the command. Step 3: Reopen the Browser and Navigate to your desired Video on YouTube. Step 4: Hover your cursor over the right hand corner of the Video to bring forward the Download This Video button and click on it. Step 5: As .flv (Default YouTube format) is not supported by PowerPoint, you need to convert it into formats like .avi, .wmv, or .mpeg. This can be done by moving your cursor on Downloader when the download is complete and then clicking on Convert. Step 6: Select the destination directory where you wish this converted Video to be saved. Step 7: Click Start to begin the conversion process. Step 8: After Conversion is complete. Navigate to PowerPoint. Step 9: You can then insert the Video into your Powerpoint Slide in versions using ribbon, by navigating toInsert > Movie > Movie from File. If your version of PowerPoint uses the traditional toolbar, go to Insert > Movies and Sound > Movie from File. Step 10: Select the converted Video from the Path you stored it on and hit OK. If everything went the way it was supposed to, your Video will now play fine in your Powerpoint Presentation without an Internet Connection.